This is the second session of the Women in Foreign Policy symposium. To commemorate the fifteenth anniversary of the Women and Foreign Policy program at the Council on Foreign Relations, this symposium convenes leading experts on global women’s issues to analyze the status of women worldwide and evaluate their contributions to governance, economic growth, and conflict prevention and resolution. COLEMAN: Good morning, everyone. If you can take your seats, we will get started. I know it’s always hard to get back from a coffee break, but hopefully you can all come in and take your seats. And a real sincere thanks to Richard Haass, also, who’s in the back. I think to be fair, Richard, when you came to CFR, you had some skepticism. What is this Women in Foreign Policy Program? And according to Richard, who said this to me, he read a Foreign Affairs piece that I wrote called “The Payoff From Women’s Rights” back in 2004, and he said a lightbulb went off, and he said, ah, now I get it; this is actually really important stuff. And that is the topic that we’re going to be talking about this morning, which is “The Status of Women in the Economy,” but it could also be called “The Payoff From Women’s Rights,” talking about the role of women and their economic participation. And we have a fantastic panel of people who are real experts on this subject, and have a great experience in both the public and private sectors. I’ll start with, on my immediate left, Heidi Crebo-Rediker, who’s an adjunct senior fellow here. She’s also the CEO of International Capital Strategies, and has served both in the public and private sectors over her long and distinguished career as an investment banker in Europe, as an advisor to the Senate Foreign Relations Committee on the Hill on economic issues, and then appointed to the State Department as the first chief economist to really help drive the whole idea of economic statecraft at the State Department under Secretary Clinton, with the idea of bringing much-needed economic analysis into policymaking. So thank you, Heidi, for being here. We also have Tom Nides, who also has a very distinguished career in both the public and private sectors. He is the vice chairman of Morgan Stanley, and has had a long Wall Street career with Morgan Stanley and Credit Suisse, First Boston, and other institutions. But has also worked at the State Department as deputy secretary of state for management, really the COO of the State Department, but I know he was also very heavily involved in policymaking there. And started his career on the Hill as an assistant to both the majority whip and the speaker, so he really knows the ins and outs of Washington and the global economy. And then we have Lareina Yee, who’s a senior partner with McKinsey from the San Francisco office. And she gets a big shout-out for having just taken the redeye in and arriving, and looking terrific, no worse for wear on that. Lareina works on high-tech infrastructure and information services in the San Francisco office of McKinsey. But for our purposes here, she—we should also recognize that she has been driving McKinsey’s work on women in the workplace, and has actually launched an initiative several years ago, a big research initiative in conjunction with Sheryl Sandberg and the Lean In organization there on women in the workplace, and has some great data that she can share with us from that. So thank you to all of our panelists for being here and sharing your experiences and wisdoms with us for this conversation. So, Heidi, I think I’ll start with you. And maybe you can just reflect on the fact that governments seem to have finally gotten the importance of this topic. I remember when I wrote “The Payoff From Women’s Rights” in Foreign Affairs, it was making the case for why we had to invest in women. I think governments now understand that, generally. The question, then, is: How? And you’ve seen both government initiatives and multilateral initiatives, whether it’s the APEC, you know, forum or the G-20, the IMF, various institutions and networks and multilateral groupings have made commitments, signed up to increasing women’s workforce participation, women’s role in the economy. So clearly they get why it’s important. They’re setting some targets to do that. But what impact are they having? How robust are they in following through? How much are they prioritizing these initiatives? Or are they just sort of photo-op and feel-good things? Are they driving change at a governmental level? CREBO-REDIKER: So I think where governments started to become more interested in this issue was when we started to characterize women’s labor force participation as a driver of growth. And somehow, when you—when you take it away from just being a human rights issue or a development issue—which there’s been a lot of work over the years—but when you really put it through the prism of growth, and the fact that with better data and better analysis over the past decade or so we can look at where women have entered the labor force and driven growth in ways that we, I think, found unexpected, we being the policy community. So, you know, if you look at the U.S. just as an example, between 1970 and 2009 you had about 38 million women join the labor force in the United States alone, and you see on the back of that that the economy in the U.S. was about 25 percent bigger as a result. That was some of the initial work that McKinsey did. When you look at where the investment’s gone, we’ve seen globally a very significant investment in women’s and girls’ education, such that you’ve really seen those education gaps in most of the world, both developing and developed, closed, and in a lot of places you have tertiary education women actually exceeding men. You have—so you have a huge investment, huge investment if you look at it as sort of an asset of highly-educated women—not in the STEM areas as much, but still, you know, highly-educated women. You’ve seen poverty rates come down. You’ve seen health improve. And yet, over the past—the past two decades, you’ve seen women’s participation globally flatline. So, you know, 50 percent of the world’s population, and yet it’s sort of stayed at 50 percent participation. So sort of looking at, you know, how do we—how do we catalyze something that should be low-hanging fruit, which is getting more women who want to or need to participate in the labor force to actually do it? What are the barriers to that? And I think the good news is we’ve come a long way in understanding. It’s leadership. It’s, you know, Christine Lagarde. It’s Abe in Japan putting it at the top of Abenomics, you know, to increase Japanese women’s participation as a—as a way to catalyze growth. It’s institutions like the OECD and the U.N. and the IMF—IMF in particular—looking to institutionalize women as a driver of growth. And getting very—you know, what is it? It’s tax policy. It’s budgeting policy. It’s the laws that constrain in many different countries women’s participation. They can’t get titling rights or open a bank account. What are the things that are actual constraints? So we have this huge body of knowledge, and yet we haven’t really seen a lot of movement. The G-20 you referred to in Australia set a target of 25 percent increase in women in the labor force between now and 2025. I don’t know if a lot of governments around the world are actually looking at that metric and trying to drive policy changes. There have been some countries that have—that have increased family leave policies or have invested in better childcare. We know that there are—we know from all of this analysis that there are certain things that can actually change the dynamic, and yet we haven’t really seen a lot of countries actually take those next steps. COLEMAN: So, Lareina, maybe I can turn to you, because McKinsey has done an enormous amount of work on this topic, and actually came up with the much-quoted figure of $12 trillion that could be generated in the global GDP if the gender discrepancies between men and women were reduced, and particularly on labor force participation rates. YEE: Absolutely. And labor force participation, I agree with you, is a great way to start, because if you look at over 95 countries globally, that participation rate varies from 17 percent to 41 percent. So, without even doing any more math or fancy analytics, that doesn’t sound equal. And when I think about equal, if you take a look at women and men able to participate in the global economy, women comprise 50 percent. And so there is a huge gap in that participation, and that the value of it. And I do think, much as you said, the reframing of a social problem to an economic opportunity is a really important thing, because in some ways what I notice when I talk to business leaders and political leaders is that it changes your reaction from I should do something because it’s the right thing to do, to I should do something because it’s right and because it’s economically beneficial and every single person will benefit from that. So when you take the global participation landscape and then you say what does that look like if I shift that to the corporate sector, that same business case advantage exists as well. So, in research that we’re publishing in January, just a month away, one of the things we have looked at is what is the value of women participating the profitability of companies? And our global research now shows us that the EBIT margin, or the profitability advantage, is 22 percent for companies that have a gender-diversified management team. So you start putting all these big numbers together, and sometimes I just like to simplify the math. There is a lot of value in having women at the table, especially in leadership positions. But when we look at the corporate sector—and this is the—kind of it’s similar to the participation globally—we see that we in the U.S. graduate 57 percent women from our colleges. From Barnard, where Debora was, all the colleges in the U.S. And we start the workforce at 41 percent participation in the corporate sector, and that dwindles, percentages by percentages, each stage. So when we look at top teams in the U.S., we’re at 17 percent women represented amongst an incredibly educated and capable population. And so the thing is is that the business case or the economic case is clearly not enough. And I think that’s actually a really good jump-off for some of the things we’re going to talk about today. So, Tom, as vice chair of Morgan Stanley, you are a senior manager in a company, and you’re advising a lot of big multinational companies. How do—how do you talk about this issue with—both internally and with clients? And picking up on Lareina’s point that companies with more diversity actually do better. NIDES: Well, first of all, thank you for having me on the panel. I actually had the opportunity—Heidi and I worked together at the State Department, and I was honored to have her come work with us, and then she became the first chief economist of the State Department. And this is a prime example of what it takes to have someone who happens to also be a woman to basically take a job that didn’t exist and make it a really important job, and force all of us to think about economics and statecraft in a way that put that on the map. And I was proud to work with her and with Secretary Clinton. So I have a strong—you’re pushing on a big open door for me vis-à-vis this issue. Listen, as the McKinsey report—we had the same studies done. Guess what? You have more women at the table and you have more programs that affect different populations equally, you actually make more money. This is not particularly complicated, right? If our clients and customers are diverse, and if you have a bunch of people around the table who look like me, it’s very hard to be able to communicate as you think about not only products you’re selling, but deals you’re doing in an effective way. So we have—you know, we have studied both the technology companies, who quite frankly are even behind some of the manufacturing companies vis-à-vis numbers of women on boards. You know, I was looking at some statistics before I got here. As you know, labor—labor participation has basically been flat-lined for women over the last 15 years. It’s about 50 percent as pointed out to you. The problem here is the growth among the C-suite is at—I think at CEOs and Fortune 500 companies is about 5—5.2 percent approximately. At this rate, it will be 50 years from now by the time women are equally proportioned at the C-suite, and the reality of this—if you want to get things done, it actually matters who is in the room. And a guy who has been fortunate enough to be around all of this, it happens to be true. And I think, you know, the numbers of men and women on boards are important, the numbers of C-suites are important, and it is about making money. This is not about is this the right—of course it’s the right fit. But that doesn’t move the needle. What moves the needle is is when McKinsey does a report and Morgan Stanley does a report and shows that the companies who have either diverse boards and senior management that look like the customers, they actually perform better. So this has become—I think has been driven into people’s minds enough to understand the value proposition. We—data matters, OK? Numbers matter. People—we track everything at our firm, right, and this is an area where you always get pushback. Are you suggesting—you’re talking about quotas? No, no. We’re tracking this as we track everything else. How many women do we have in pipeline? How many women do we have in senior management? How many women do we have on our board? What is—how do we project to our customers and clients? And for our perspective, the ROE numbers speak for themselves, so that is how we kind of address it, and it isn’t anything more about how do we feel about it—no one cares about our feelings. What they care about is how do they make more money, how do their shareholders feel about the companies in which they are invested in. So it’s a—quite frankly, it’s been a business case, it’s been a passion of mine for a long time just because the nature of the—how we’ve worked in a very diverse—both business and in government, and quite frankly, the government is as bad if not worse than many corporations. I mean, Heidi and I worked at the State Department which—I love everyone at the State Department, but make no mistake, the people who get to the top of the State Department—not the secretary, luckily—but those who are ambassador ranked, it’s abysmal as a number or percentage of women who should be at the ambassador ranks. As someone who was part of the deputy’s committee who selected the ambassadors, it was a passion of mine to drive more women into the senior ranks of the foreign service—really important because it drives everything else down the processing. If there are women at the top of the pyramid, it helps drive everything else up. CREBO-REDIKER: —on something that was mentioned to underscore the importance? You mentioned data and you mentioned data. The—the impetus for—on the macro side—a lot of the analysis that—that has been done in the past decade is really—the OECD started to collect very—very detailed data on 100-plus countries, and based on the data that they collected, they were able to do the projections of what an increase in women in the labor force would mean in terms of increase in GDP. And then the IMF took that data, and McKinsey took that data, and Goldman took that—everybody took the data and took another slice at it, but a lot of that data is now old. It’s not being constantly updated, so if that investment is not made on the public side in the institutions that are actually, you know, putting together the data that everybody uses, then you—then you don’t have anything to measure over time. The IMF has taken a big lead in—in pushing not only for data and analytics, but on the good news side, they—because all the countries are kind of—it’s treaty bound—it’s actually—it’s like a treaty-bound organization. They have mainstreamed a lot of their—their work on gender and the economy, and inequality, but also particularly women in the labor force. They’ve included it recently in some of their—their lending programs, for example, to Egypt. So if you mainstream so that you’re tracking—you’re tracking and requiring countries to actually produce data and now they’re doing—now they have 27 countries that they’ve done what—their annual checkup, which is in Article IV, of what’s happening in the economy. If you are bound to actually produce that kind of data, and those kind of lending programs are linked to—to better childcare, safer transportation, real access to job opportunity for women, that’s where I think we’re at early stages of moving the needle, but I would put that totally in the good news category. COLEMAN: Tom mentioned the Q word, the dirty Q word of quotas, and I just wonder what each of you think because we have an aversion to quotas in the United States, but Europe actually embraces quotas in a lot of different ways, and governments around the world have used quotas both in the corporate world, but also in the political world to increase political participation of women. And I actually remember I was in a meeting in Yemen, of all places, talking with all these women who were running for office there—this is some years ago—and Helen Clark was there. And the issue of quotas came up, and they said, oh, we don’t want quotas, and Helen, who had been elected head of state in New Zealand, said, oh, ladies, if you can get a quota, take a quota! So her reaction was interesting to me, too. And I’m just curious on—Heidi, maybe you can start, and just how—when you are talking about moving the needle, and you’re talking about the G-20, and the OECD, and the IMF, and all these things, do quotas ever come up, and how are they viewed? CREBO-REDIKER: Sure. They certainly come up. I think it varies from country to country in terms of what the appetite is for taking on quotas and actually setting targets. And so I think that there is use in both of those—you know, that comes, you know, to the fore when you are talking about getting women on corporate boards, when you are talking—particularly in Europe right now there are targets and there are quotas, and the quotas are clearly more effective. I think that’s sort of one of the lessons. But I don’t know if it’s culturally, socially and politically something that every country out there can—can do. YEE: I mean, I’d love to pull together the targets and the data because—so one thing is people talk and they start with the Q word—quotas—and then that takes you a very specific direction in the conversation. But quotas aren’t the only ways to actually create measurements, and so what you see in corporate America is quite a lot more use of targets. And what—and there are lots of types of targets, but at the very least, saying this is what better looks like this year, next year and later. And if you don’t have a specific goal, how will you know if you are actually making progress? And so an interesting thing is that 90 percent of CEOs in our benchmarking across—which is a very consistent set of kind of Fortune 1000 companies, say that they would put gender diversity or female representation in business as a top 10 business priority for them. That’s great. When we ask their employees, do you believe that your company is committed, and do you think your company has a credible plan, men and women—men and women—less than 50 percent of them believe that that was true. So one more thing. Companies that have set targets, that belief gap is lower, and they are performing relatively better. Now when you say relatively better, it doesn’t mean that they have 50 percent women in the C-suite. It means that there are percentages differences—you know, 5, 6 percent differences in their relative performance to everybody else. But if you think about a company that employs 70,000 people, I’d rather work at the company and be a leader of the company that has 5 percent more women in every single rank at that company. And so setting targets is really—can be a really powerful tool, and then you can decide, as a team or as an organization, how you want to, kind of—how you want to put more, sort of, layering to that? Do you want to tie that to compensation? Do you want to—how often do you want to show accountability? How transparent do you want to be? But the very first step is to say what would success look like, and my advice for companies is to set realistic targets. So the worst thing that you can do is say, oh, well, in three years we’re going to hit 50 percent at the C-Suite and the SVP layer because if you are only at 20 percent, everyone knows that’s mathematically impossible. So set realistic goals and move towards them. NIDES: So I’ve spent a lot of time on this because I find it—I find it kind of an interesting topic. You are what you track, I used to tell everyone, right? So we track everything, right? And, you know, I work at a company that’s very numerical, and you are what you track. And the numbers don’t lie; either you have it or you don’t have it, and if you don’t have it, you’ve got to figure out how you’re going to get there. I find this whole issue around quotas a little bit of a copout because what—really what they’re saying is you want to promote someone who’s not ready to be promoted, which is kind of the backhand way to say it. Because that’s when we’re sitting around the room and we’re promoting people, they’re all, like, oh, well, we don’t really want to promote, you know, Heidi because she’s—you know, I know she’s a woman, but she’s really not ready. (Laughter.) I’ve been—I have been in thousands of promotion meetings in my career, OK? We never say this about white guys, OK? (Laughter, applause.) We never sit around the room—no, I mean, I don’t mean to be pandering to the audience here. But I—but I do sit in a thousand rooms where we say, God, you know, Tom, you know, I just don’t—I don’t—we shouldn’t probably overpromote him, because I’m afraid he may fail. OK, we fail all the time, OK? So I think there’s a little bit of a sense of this has become a little bit of a cop out. And it’s getting better, but it’s a little bit of a cop out in the world of promotions. And I think we should be realistic about that. You can’t promote someone just because of—if they happen to be an African-American, they’re a woman, or whatever they are. But we do need—we need to track it and you need to make sure you set up the right systems. The problem we have in corporate America, in my humble view, is not—we can—we can hire just about anyone, right? Keeping them is another issue, OK? Retaining talent is a real issue, especially around women in the workforce, and providing them the environments and providing them the opportunity to grow, in my view, is the biggest struggle that we’re having. So I am a big believer in I don’t really care what you call it—it can be targets, it can be quotas, it can be, you know, you’re just not going to get paid if your workforce doesn’t look like what we’re telling you to be paid, is what we tell our managers. So you can decide whatever way you want to get there, you better have a workforce that looks like what we believe your workforce should look like. So maybe not totally politically correct as it relates to this, but it is a realistic issue for us at our firm, and certainly I think is for many corporations, that you need to have very clear distinctions between what’s acceptable and what isn’t acceptable vis-à-vis the numbers across the organization. COLEMAN: Thanks, Tom. And in terms of retaining talent, I know that you’ve been a big champion of paid family leave. Do you want to just spend a minute on that issue? NIDES: Yeah, actually, it’s funny, because everything comes full circle. I was on—I used to work on the Hill, as you pointed out. And we did—I was part—I worked for the speaker of the House and the—that’s when the Democrats were in charge. It was a long time ago, in the early—the Stone Age. Many of you weren’t born then. But we were—we were actually in charge of both the House and Senate at one point. And when we did this, we did the Family and Medical Leave Act. For those of you who remember, that was really controversial at the time, because the—again, a lot of my friends at the Chamber and NFIB and all the other business organizations said: It’s going to kill corporate America. If you are allowing people to take three months off, that will be a devastation to successful economic growth in small businesses and big companies. And that was, as you know, two decades ago. They said to us at the time, and if you do that—if it passes, you know what’s going to happen? All the organizations are going to want to get paid family medical leave. And they were right. Twenty-five years later, guess what? There’s a big movement in states and on the national to have paid family medical leave because, guess what, you can give people benefits but if you don’t’ give them any money who can take it? Who can afford to take two months or three months off to be with your newborn or a sick parent when you get no cash? And so there has been movement. In California it’s been passed and three or four other states, New Jersey law, Connecticut, where they are in fact putting a paid medical leave process in which you get some amount of money, not your full compensation, but some money. So our view of this at Morgan Stanley is—and, again, we’re different than most companies. We’re rich—don’t—I mean, don’t quote me on that. (Laughter.) But we’re well—we’re not poor. And we have four months of paid medical leave, OK? And we have paternity leave. We are not like most companies. I accept that. But doing something around the edges as a federal program I think is worthy. I think at the end of the day, women in the workforce—we’ve been lucky—and I have a working wife who’s worked from the moment I’ve met her. And we have been fortunate, because she probably doesn’t need to work. We probably could get along if she doesn’t. But she has. And we’ve been lucky that we’ve had money to pay for help. We’re the fortunate people, OK? Most are not as fortunate. Most women who work have to work, OK. It’s not because they’re doing it for kicks and giggles. And providing them some opportunity—even for Morgan Stanley—to give them the feeling of there’s a program. We then have an issue with us is to make sure that the women feel good about taking it. So if you offer them a program, but you are shamed—not shamed—but you’re feeling like, oh, you really do have to get back in a month because if you don’t you’re going to get off the fast track. So we’ve created an environment that we really want people to insist upon—not insist—encourage them to take it to set a role model. So I’m a big believer in this. I’ve been really involved in the movement. It’s important, because I do think it all gets back to the bottom line. I think it makes more successful and it’s good for our business and society. YEE: So I was just going to highlight a couple things that you mentioned that I think are incredibly important. So, one, is that it’s family leave. So it’s both for men and women. It’s paid. And the third one of the cultural shift, which is that when we asked men and women why you’re not taking advantage of the flexibility programs—paid leave, family leave being one, and then a whole slew of other programs and policies that good companies like Morgan Stanley and others offer, the number-one reason was fear of professional risk that they were going to take. And that’s a luxury if you’re not worried about the economics, if its paid. So what’s really interesting is that you can offer it, then you can have good policy, you can benchmark yourself to the number of weeks that you should have, which is a rising bar in a good way. I think we’re starting to see 16, 20 weeks becoming a new norm. We see eight weeks for men. So you can start to see that. But you also have to drive the behavior change. So I’m in the tech sector, so obviously—(laughs)—I’m just looking at all sorts of social media things all the time. And I notice that Zuckerberg posted, I think, last week that he is going to be taking a couple months off, because they’re having another child. And the reason why I mention this is because the role modeling of a powerful man taking leave and posting a picture of himself with his daughter is incredibly important, because what it says to people in the valley and what it says to people at Facebook is if the CEO, who has a really big job, can take family leave, I can take it too. And if people actually take it, then the value that it is supposed to deliver can actually be achieved. People can take a breath. People can actually connect. It’s funny, when we introduced paid leave for our male colleagues, I thought all the females when we changed the number of weeks to substantially increase them would write notes, because I lead our North American women’s program and all of our initiatives. And I actually got more notes from men. And the notes were things like: Here is a picture of me and my baby. I figured it out. We’re a dual career couple, which you’re seeing more and more in Millennials. My wife and I figured out how to maximize our time with our newborn. And I realized actually how hard it is to juggle and what it takes. And it actually reset the norms of our household. So that person, that couple is going to bring that back to their corporate setting. And they’re going to role model something very, very different for the entry-level people coming up through the ranks. YEE: It’s an opt-in. It’s an opt-in system. CREBO-REDIKER: So it’s good to have a little perspective coming into this topic. COLEMAN: OK, I’m going to turn to questions from all of our members. There are a whole bunch of questions we didn’t get to. I hope that somebody will ask about the whole sexual harassment—(laughter)—shenanigans that are going on, and ask our panelists around that, in particularly Lareina has some great data on that too. But we’ll turn to you. And we’ll start with Lauren in the back. Q: Thanks, Isobel. I’m Lauren Leader-Chivee. I’m the CEO of All In Together and an executive advisor at Oliver Wyman. I spend my entire career working on these issues. One thing that did not come up in the conversation, which I think—you know, when you look at the OECD, and you look at the countries in the world who have the highest labor force participation, have the greatest gender equity, there’s a very glaring dimension which is very high political participation of women in those economies. And in all the conversations that we wind up having about the workforce in the U.S., and about gender equity and the Fortune 500, we almost never make that connect. We almost never talk about it. And we never draw the line between political participation and women’s gender equity in our economy, labor force participation, et cetera. So I know all three—well, two of three, I think, have crossed those lines in your careers. And I know, Tom, you talked about the importance of paid leave as just one example of how we drive greater labor force participation. Only 15 percent of Americans actually have any paid leave, even with, you know, great firms like Silicon Valley, et cetera. Most Americans don’t work for those. So if you guys could talk a little bit about what you’d like to see happen in terms of just that—a deeper connection between political participation, economic growth, gender equity. I think it also touches the harassment topic. So I don’t see them as separate, but I feel like the national conversation has completely divorced those. And in the U.K. and other places where they’ve made dramatic progress, even without quotas, it was because of public pressure from, you know, a threat of legislation, et cetera. So if you guys could talk about that, I’d appreciate it. NIDES: I’ll head it off. I mean, we could have done a lot if Hillary Clinton had become president. (Laughter.) I know I’m not supposed to say that, but just hypothetically, that could probably move the dial a little bit more effectively. Hopefully that’ll change at some point. But I think—I think the real question for all of us is accountability. So—and I—and I think, from both—both on my left and my right, the question around holding people accountable—we are accountable to our shareholders, right? We’re accountable to activist investors. We’re accountable to our employees. Accountability drives behaviors. When our shareholders—our biggest shareholders believe that we are not performing at the level we’re performing at, we have to change or the management will be gone, right? It’s not very complicated. On these particular issues, holding corporations and, to some extent, governments—and Heidi can speak, you know, greatly about that topic—that’s the difference between success and failure. So I think we spend a lot of time on that as firm, trying to get ahead of the—ahead of being put on the front burner, and trying to address those issues quickly. But make no mistake, there is a sense of what are—what people who are investing with us want and expect. And if we can make the business case that more women and more diversity in our C-suite, on our board, in our senior management will create a return on equity that makes some sense, then we’re ahead of the game. YEE: So just as also a different thing that you’re raising. So there is the business benefits. But there is also a participation of women more broadly. And that’s a systems question. And I don’t think it’s just the private sector and the government. You’d also have to look at academia. I’m pretty sure the percentage of women with tenure is not where we want it to be. You’d have to look at education. So I think if we looked at the entirety of the economy and you split it into—including your political leadership—if you split it into these different segments, you’d find that women are underrepresented in each and every one. So if the simple question is should we be making progress across all of those? Absolutely. Are they related? At the most basic level, even before you put economics on it, it’s the most simple thing of being able to look around the society economy and business that you participate in and see yourself as a potential leader of that. So, I mean, absolutely. I think we did focus on business, because I think two of us are in the business sector. And I do think with private companies, you have to ask: Why can’t they be leading this change more assertively? CREBO-REDIKER: So you’re absolutely right. 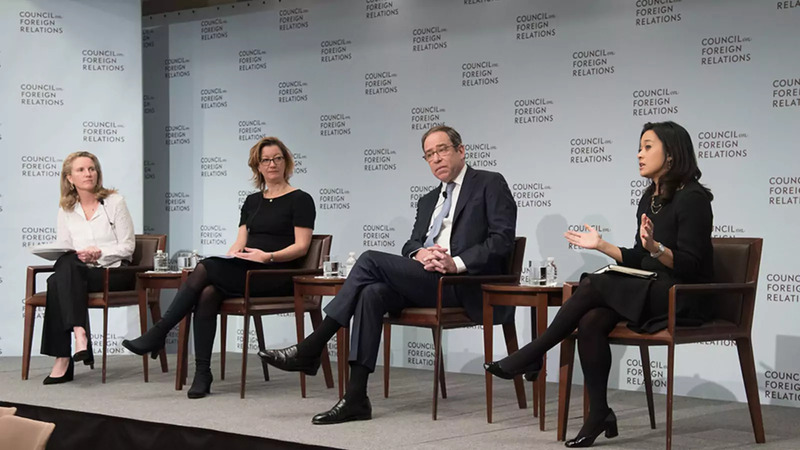 And there are—for a lot of the multilateral organizations that are focused on this issue, they look at—they look at participation, levels of education, political as well as economic. But the reason why I think it’s important to kind of bring it back to that prism of growth, at least for policymakers, is because then you get into those parts of decisionmakers and governments in the ministries of finance or the ministries of economy, where they actually can change policy—tax and budgeting policy to be more sensitive to how you can actually enable more women to get into the—into the workforce. And so I—you know, there’s certainly a connection between political participation and participation in the economy. But you can actually—there’s so much work that’s been done on how you can actually just, you know, catalyze that amount of growth, just from some of the simple policy changes that you can make. And you need to just get into those right people in every country in the world, and make sure that those changes happen. Q: Thank you, Isobel. Masuda Sultan, Insight Group. Picking up on this issue of the political empowerment linked with the economic empowerment, in developing countries what I’ve seen is it seems to me a little bit easier with quotas to effect the political empowerment, especially in a country that’s coming out of conflict, for example. But the economic piece is something I see a lot of countries still struggling with. And it’s not such a quick fix, if you will. Are there things that can be done—you know, besides sort of longer-term policies about legislating women’s inheritance, you know, rights and things like that, are there sort of quick fixes in the economic sector that can be employed, similar to what you can do in the political sector with quotas? CREBO-REDIKER: So one of my favorite—one of my favorite stories is the story around legal changes. And the World Bank has done a lot of work on what the legal barriers are. Changing legal barriers—there are cultural and social issues around why laws are the way they are. But if you change them, it doesn’t cost anything. I mean, you can allow both spouses—both, you know, men and women to own property, to be able to petition a court, to be able to open a bank account, or do a whole variety of things in an economy that a lot of emerging markets just don’t. That’s changing very quickly. But you can now take those legal barriers, and when those barriers have changed in a whole range of countries around the world, that you have seen 5 percent bumps over five years. If you have constitutional equality between genders in the five years that follows, you get a 5 percent bump in women in the labor force. And so there’s sort of—if we’re looking at quick fixes, those are the ones that are—you know, now have been tracked over time. They’re getting better. But there’s a lot you can do with that in terms of looking at accountability and how those legal changes can actually impact women’s participation. Q: Hi. Tara Hariharan, NWI. On the specific issue of U.S. female labor participation, I was just thinking about sectoral implications going forward; you know, some where it’s more promising and some where it’s not quite. Specifically, what came to mind, for instance, is the health-care-services situation is very promising, because there’s already fairly high female participation, and we will have a great need demographically for health care going forward. But what are sectors where you think need improvement? For instance, I’m thinking of tech to a certain extent; Lareina especially because of the gap. NIDES: I’m thinking of tech too, by the way. YEE: —big bull’s eye headed my way. So I’m going to challenge that the health-care sector is doing all that it can. And then, of course, the—let’s just be clear. Of course, the tech sector needs to do better. But so the health-care sector has 70 percent entry-level jobs women-represented. That is outstanding. That’s really high. So we’re really excited about that. But guess what. They end up exactly the same place as all the other sectors at the very top. So I don’t think we can be super-excited about that. Let me just add another piece of it. So, in some other McKinsey Global research and for a topic of a different time, we’re looking at the future of work and the role of automation in displacing activities within work and changing the kind of composition of labor and opportunity. So the health-care sector is actually a sector where there will be more jobs. They’re harder to automate. You can’t—for a lot of the tasks, you can’t put a bot there, although that’s not exclusively a care for the health-care sector. So let me just put those two things together. There’s actually job-creation opportunity. There are a lot of women at the start, but we’re no better at the finish. It seems to me that across the health-care sector, there’s something else to be done. And where I would focus that spotlight is in the dips that happen right after. So if you were to say what I would measure, I would measure promotion rates in the health-care sector between entry, manager, director, because that’s where we’re losing an enormous amount of talent. And what’s really interesting is people say, oh, well, maybe they don’t want to work. Maybe—you know, maybe women just want to go home and have their babies or something like that; you know, some sort of societal stereotype. Well, it turns out if you ask women, in the next two years are you thinking about leaving, and what would you go do, very few—like, 70 percent of men and women are, like, no, no, we’re staying. But of those who think that they’re going to leave, like, less than 2 percent are going to leave to take care of their families. They’re going to leave your company and go work somewhere else. They’re very, very clear on their intention. So that means that we’re not really harnessing the full value of women talent, especially younger female talent, in the health-care sector. Now, the tech sector, by contrast, kind of just looks bad from the beginning. So we have—you know, if we think about software and coding, where all the growth in the jobs are, we have 18 percent women graduating with CS degrees. It is the only major where we’ve actually lost women representation in the last decade in the United States. So for everywhere else, we’re kind of, like, stagnant; you know, like—oh, it’s, you know, like, bad to be stuck. This one, we’ve actually lost women. And then the tech sector kind of is able to squeak by, like, 35 percent at the entry level, and then it holds on to the women as much as they can. And you end up at the same level at the top, about something between 15 and 19, 20 percent—not a lot. So the tech sector has a lot of work to do. A lot of the challenges in the tech sector start back earlier. And, you know, while I’m not an expert in education curriculum, you might wonder if we could do more to actually bring people to the education that connects them to the jobs. NIDES: I mean, interesting; I think the tech sector is where the financial-service sector was 10 years ago. First of all, there’s an enormous amount of focus on the tech sector. You know, they’re many of our best clients, obviously. But because it’s a hot sector, right, everyone wants to be part, be focused. Everyone thinks they’re going to be a millionaire or billionaire by being part of the sector. And since the spotlight is now on these companies, they’re expected to do and perform at a higher level than everyone else. And I’m shockingly—as they say, the emperor has no clothes. They’re now fixing and trying to address a level of expectations that’s very hard to achieve. The tech sector is no different than the financial sector and many manufacturers on the struggles they have to retain really high-level and high-talented women. It is not to the point that they can’t hire. They can hire plenty of women. It’s keeping them, creating an environment for them to stay, promoting them at an equal basis as men, and creating the environment for them if they want to be participating. They’re doing what we have to deal with and still deal with, but they are now in the spotlight, as we were, say, 10 years ago. Q: My name is Galen Guengerich, and I will ask the question about sexual harassment. And I’ll ask it in a particular way. My day job is as senior minister of All Souls Unitarian Church. So I know a lot about the impact of sexual harassment on women’s lives. And it strikes me that mostly the argument about why sexual harassment is a bad thing is being made in moral terms today, which is a good thing. And it is apprehensive. But what I wonder is if the argument couldn’t be made in parallel to the argument that you’ve been making about women’s participation, which is based on what is absent. What I know is that women’s lives change profoundly over the long term because of sexual harassment and sexual assault. They leave graduate school. They leave companies. They leave industries. In some cases they leave the workplace. That absence seems to me to be economically quantifiable. And I’m wondering if, in addition to making a strong moral argument, which absolutely must be made, whether there’s an economic argument to be made based on what is absent from our workplaces and our economy because of the consequences of sexual harassment. NIDES: So let me—since—let me just—because obviously this is a complicated issue. The level for me is—I mean, obviously the behaviors that are being publicized are repulsive to any sense. What’s going on here has created a level of anxiety and focus on an issue which has been around for a long time. Having a working wife—women on all sides of me have been working their careers—this is a relevant issue that has been going on for a long time. And getting a spotlight on it is really important. And I think we’re all understanding. I do not believe that all men are pigs, just so we’re clear. And I want to make sure that we weed out the bad guys and the behaviors, but not at the cost of making sure that women and men in the workforce are not working together, but a man uses it as an excuse that I can’t have this woman on my team or should I not do this event with them, and using it as some level of an excuse why we can’t, at the same time, promoting men and women, because, to be clear, in an environment where there’s way more men than women at our firm, part of this has been—to getting ahead is for a woman to be participating in many of the men’s activities. They’ve been going on for a long time. We started the first massive golf tournament, teaching more women how to play golf. Is that ridiculous? Not really. It is—there is some evidence of golf and social activities. I want that to continue. I want to weed out the creeps. I want to get them out of these firms and get them out of the media and get them out of the companies. But I don’t want to have people use as an excuse in how collaboration and getting ahead and focusing on the women who are exceptionally talented in getting—that’s easy for me to say as a guy, but I do believe that’s the right place to be. And I think people—we’re certainly seeing a recognition. Interestingly enough, we’ve—you know, we’ve been very aggressive in making sure that people feel at our firm—they can call the hotlines and do all that. We have been—interestingly enough, the investment firms—and hopefully I’ll—hopefully I won’t live to regret saying this—have been pretty good about this topic over this year, just by the nature of the robustness of our HR functions. But it is, without question, something that we’re all taking seriously from a performance, but more importantly, as making sure that we not—we address the actions, but make sure the consequences are not harming the same women we’re trying to help in their careers. COLEMAN: Anyone else want to say anything? CREBO-REDIKER: I always think that there have to be ways to quantify and measure things. My personal feeling right now, this is something that is—this is such a strong movement that’s happening, and it’s very raw, that it’s a little early to think about how you’re going to measure the economic impact of this. I’m sure that time will come. But I think right now this is something where you have, you know, a lot of people coming and saying, you know—obviously the Me Too is there because there are just so many women who have, over the course of their, you know, lives, professional or in school or at home, had these things happen to them. And so, you know, yes, at some point will somebody look at how this is damaging to companies and—but I think right now it’s sort of how—you know, it’s damaging to lives, and we need to figure out how to, as Tom said, weed out the creeps. I like that. (Laughs.) But that time will come. I just don’t know if now is that time. YEE: I also think we need to empower the good guys. So one of the things is that, as people are digesting—it’s very raw—there are very practical questions of in the workplace, what do you do if? And the what do you do if has a huge range, from: What do you do if a member of your team comes to you and says that they were sexually harassed in an extremely inappropriate and extreme way by a client? What do you do when you’re in a meeting and a government official is making completely inappropriate remarks? He’s not touching you but he’s making incredibly inappropriate remarks, and it’s you and everyone else is a guy. What do the other people do? And so you can imagine there are many, many what do you do. What do you do when there is an inappropriate off-color joke? Do you just let that pass? Do you say something? Do you say something public? So the reason I get there is to empower the good guys and gals who don’t want to have a workplace like this. We should also be thinking very quickly about pragmatic solutions right away. So what are the manager tools and practices that can be very clear on what you do on those range of situations? And we know—so one of the questions that we asked in our workforce survey was something—call it the, you know, a much softer version of harassment, which is when you see disrespectful behavior towards women in the corporate setting, how often do you see a manager or person of authority call it out—intervene on the woman’s behalf? And 55 percent of men said that they saw that, and 34 percent or 33 percent of women saw that. So even before you get to really complicated what-if scenarios, the very basic there was disrespectful behavior in the moment, 3:00 p.m. at the workplace, and there is kind of what I imagine in that scenario—there were a cartoon of some sort or, you know, a drawing in a newspaper is sort of like deer in headlights—that was inappropriate, and people don’t seem to know what to do. And I think—I see nodding heads—I think we all could write down a list very clearly, very cleanly, recommendations on things you do like, that was a highly inappropriate comment—let’s leave that at the door—(laughter)—you know. YEE: Not even basic safety. COLEMAN: —and the conversation around domestic violence 10 years ago was pretty similar and it was quantified. People started quantifying how many days men and women lost at work because of domestic violence and you began to see some changes. So the economics do matter and drive things. And there’s a question right there. Q: Thank you. Ali Mazarra with SUNY—State University of New York, Office of Global Affairs. I and my colleague here direct the program for young women to pursue careers in internationally-focused fields as global leaders in the future and we’ve been fortunate to have Dr. Coleman meet with them on a couple of different occasions. My question is they get paid internships every summer through the foundation that funds us—the Jewish Foundation for Education of Women—and they’ll often say, wow, we’re—and a lot of them are at NGOs and nonprofits—they’ll say, wow, most of the leadership is women. Most of the people—you know, my boss is a woman. And a lot of it is, I think, because nonprofits are underpaid. So how do we address that issue of women being in leadership and being paid respectably? Thank you. NIDES: Ha. (Laughter.) I don’t know. I mean, again, you’re 100 percent right, by the way. I mean, I—listen, I have—at Morgan Stanley I have—many of the back-office functions report to me—operations, communications, marketing, HR—you know, these—the functions, and I have a much more, much—many more women working for me—maybe it’s because of my—how I hire people, but—than I do guys. Now, one would say, well, it’s because those are the functions. You don’t have a bunch of—because you’re not running banking per se and that’s harder for a—for a woman who wants to have a family to be a full-time banker when they’re traveling around the world and around the country. There’s some truth to that. How do we equalize it? And just to be honest with you, I just literally walked out of a comp meeting because our—guess what? The comp pool for my people is less than the people on the revenue side. That’s just the facts of life, right. I mean, you know this at McKinsey, right. It’s not very complicated. How do you balance that out? I have no idea. You’re 100 percent right. There are more women running foundations today than men. I’m sure—I know I haven’t seen the statistics—and by the nature of a foundation, they’re making less money than corporate America. I don’t have the answer to the question. It is definitely a problem. But I have a—you know, I have a view of this is we got to make sure that we create, again, going back to where I am and having been both in government, we have to have more role models in both places. We need to have more men working in the nonprofit business. We need more women working on the business side, and that will—you hire people you know and you recruit people that are familiar to you. That’s why having more African Americans means we have more African American support. More women bring more women. It just happens to be the way it works, and that’s—I think that’s how we have to do it. I can’t answer the economic question. LEE: And it’s a—I mean, there’s also a step back question, which is we just need basic pay equity. So women in America are 80 cents on the dollar to men. LEE: And then you have to look at the racial groups. So my husband is Latino so my sister-in-law, who went to law school—I consider her really smart. My other sister-in-law, who went—and is an accountant. They make 54 cents on the dollar, on average, as Americans that are Latino. So we have a lot of very basic fundamental challenges when you think about pay equity. COLEMAN: Right here, in the middle. I got a papal dispensation to go five extra minutes, so I think we have time for one more question. Q: All right. Thank you very much. Leah Pedersen Thomas. I currently work in mergers and acquisitions, focused, ironically, on a female-dominated industry, which happens to be animal healthcare. So right now we’re facing some interesting stats in veterinary medicine. One hundred percent of graduates from DVM School of Michigan are women. And so just curious, as an investor in this industry—and by the way, I’ll add, too, that it’s one of the fastest-growing industries, and economically resilient, and Morgan Stanley just made a pretty significant investment in the industry. But with all that being said, what’s the role of investors, and in particular, gender lens investing? And then once investors have a seat at the table, what is their role in terms of encouraging policies that allow women to be successful in the workforce? CREBO-REDIKER: It’s huge. If you—it’s huge. If you look at some of the countries where they’ve gone for targets and not quotas, when you have asset managers, for example, who are adamant about diversity on boards and diversity in the c-suite, I’ll tell you, it’s really—it has an impact if you’re—if some of your shareholders are sending you a message. CalPERS wrote a letter to 500 companies—500-plus companies in August saying we want more diversity in your—you know, we want more diversity on boards, we want more diversity in the c-suite. And, you know, I can’t think that that is not going to have a really—that’s sending a really big message from a constituency that companies really care about. So I hear you, and I think, you know, particularly, you know, large pension funds are going to have influence, if they decide to use it, that could be a game changer. NIDES: Yeah, we did—we just did two studies, one in 2016, one in ’17; ’16, we looked at 1,800 companies globally—again, using the same kind of gender lens—boards management, senior management. We found those companies were performing about a 2 percent higher delta than the non-diversity companies. Now, how much is correlation versus causation? I’m not 100 percent certain because just you think about—people who think about this way probably have a better-performing company, right? If you’re having a meeting like this and you’re saying to your senior management why don’t we have more women on the board, that would suggest your company is performing at a higher level, that you can think about these things at a higher level. We then looked at tech companies, in the same breath, in ’17, and it was actually more staggering, the percentage of returns—I think you talked about this earlier—about those companies that had a more diverse workforce, especially women in it. So I think it is—especially from the investors’’ perspective—it’s all about the money. I don’t mean that disrespectfully, but it is money talks, OK, and as Heidi says that, you know, CalPERS and CalFERS (ph), and the big pension funds, they have a fiduciary responsibility to have a decent return for the pensioners who are assuming that they’re going to get the money. So they’re going to force companies like ours to perform well. And if they say you’re not—one of the reasons you’re not performing well is your board is not X or your senior management’s not, we listen to that. So the reason—I’d be curious on why there’s so many—female-dominated in your industry, I just out of curiosity would like to know that. But I think it is—the financial piece really matters, and I think we can build a case that more women in our businesses at that level perform better. COLEMAN: OK, I think we are actually out of time. It’s 11:05, and I know they want to take a break. And I see a lot of hands still up there, and I’m sorry we didn’t get to everyone’s questions, but hopefully you can pigeonhole some of our panelists at the end here.